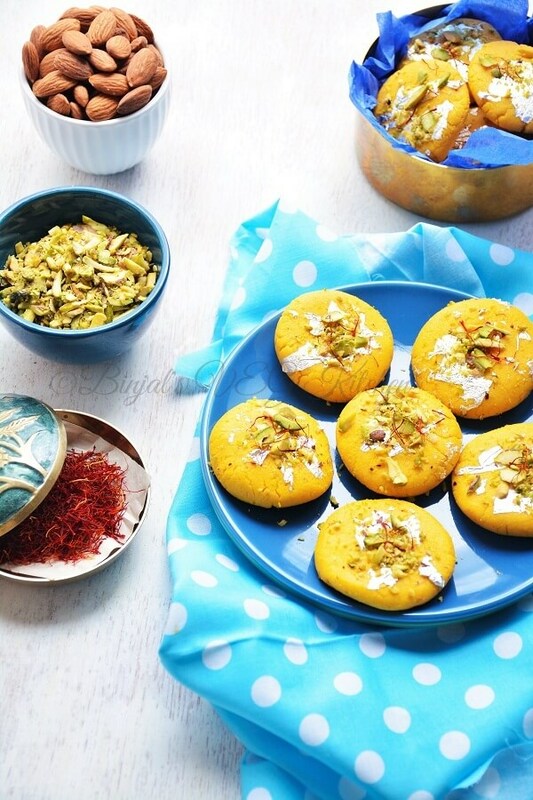 Burfi is the most popular khoya based sweet all over India and Mango Burfi or Mango Peda is one of them. Mango Barfi is a delicious Indian recipe served as a desserts. Different varieties of burfi like nut burfi, chocolate burfi, coconut burfi, saffron burfi, but mango burfi is in my top list. We can use readymade Khoya and mango pulp makes the job simpler and faster. During mango season, we prepare so many dishes of mangos. Mango burfi is one amongst them. These are liked very much by all at my home. 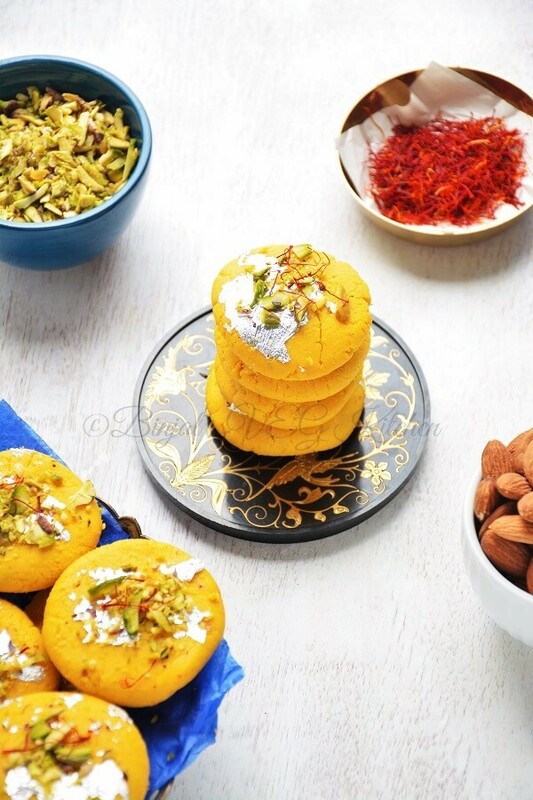 A delicious Indian Dessert make with mango pulp to create a rich dessert which is enjoyed at various festivals. 1. Peel and Chop the Mangos, blend it with sugar and make a puree, keep aside. 2. Take a pan, crumble the mawa in it and roast it on low flame for 2 minutes. 3. Add milk and stir it till mixture starts leaving the pan and forms a soft dough, remove it in a bowl and keep aside. 4. In the same pan pour the prepared mango pulp, stir it continuously for 10-15 minutes or till it becomes thick on the medium flame, then add cardamom powder and mix well. 5. Turn on the low flame. Add mawa and mix it well completely and stir it. 6. Switch off the flame and let it be little cool. Add milk powder and mix well, your mixture is ready. 7. Now spread it on greased plate. Let it be cool completely to set and then cut it into the square shape or you can make in round flat shape like peda. 8. Garnish the burfi with silver paper (warq), chopped almond-pistachios and saffron threads. 9. Your easy peasy delicious mango burfi is ready. 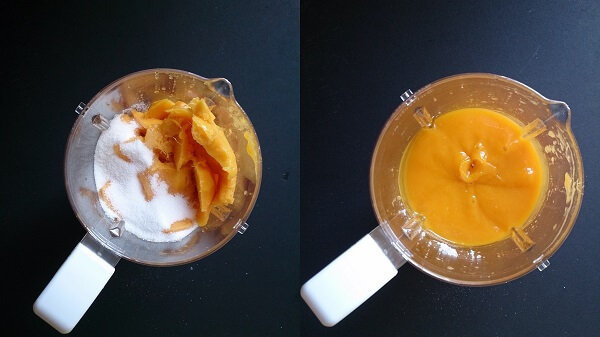 • If you are using readymade sweetened mango pulp then add very less sugar or skip it as per your taste. • You can store it in refrigerator for 1 week in airtight container. • Edible Silver paper/warq is optional, if you don’t have you can skip it. Burfi is the most popular khoya based sweet all over India and Mango Burfi or Mango Peda is one of them. 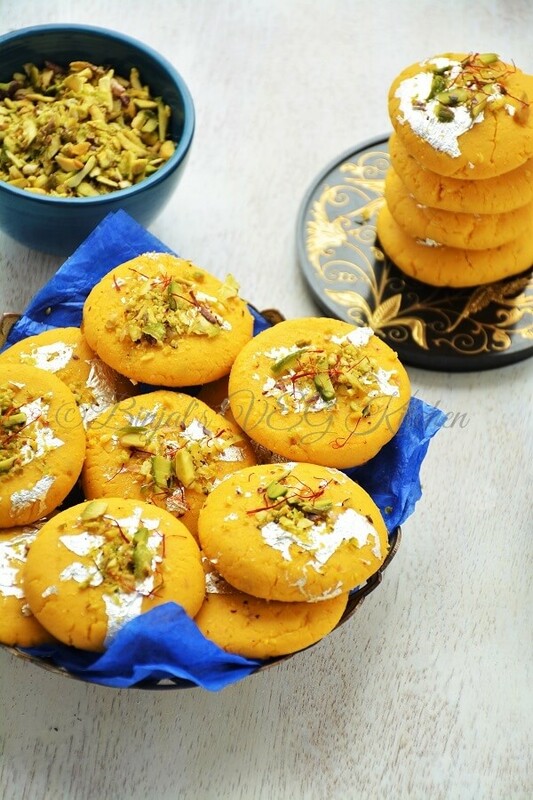 Mango Barfi is a delicious Indian recipe served as a desserts. Different varieties of burfi like nut burfi, chocolate burfi, coconut burfi, saffron burfi, but mango burfi is in my top list. We can use readymade Khoya and mango pulp makes the job simpler and faster. Peel and Chop the Mangos, blend it with sugar and make a puree, keep aside. 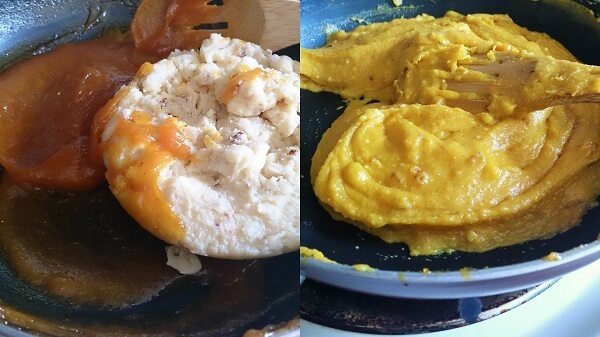 Take a pan, crumble the mawa in it and roast it on low flame for 2 minutes. Add milk and stir it till mixture starts leaving the pan and forms a soft dough, remove it in a bowl and keep aside. 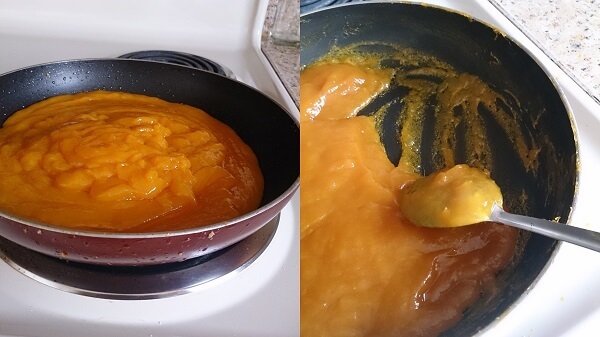 In the same pan pour the prepared mango pulp, stir it continuously for 10-15 minutes or till it becomes thick on the medium flame, then add cardamom powder and mix well. Turn on the low flame. Add mawa and mix it well completely and stir it. Switch off the flame and let it be little cool. Add milk powder and mix well, your mixture is ready. Now spread it on greased plate. Let it be cool completely to set and then cut it into the square shape or you can make in round flat shape like peda. Garnish the burfi with silver paper (warq), chopped almond-pistachios and saffron threads. Your easy peasy delicious mango burfi is ready. Wow, looking awesome! Super delicious. great presentation! 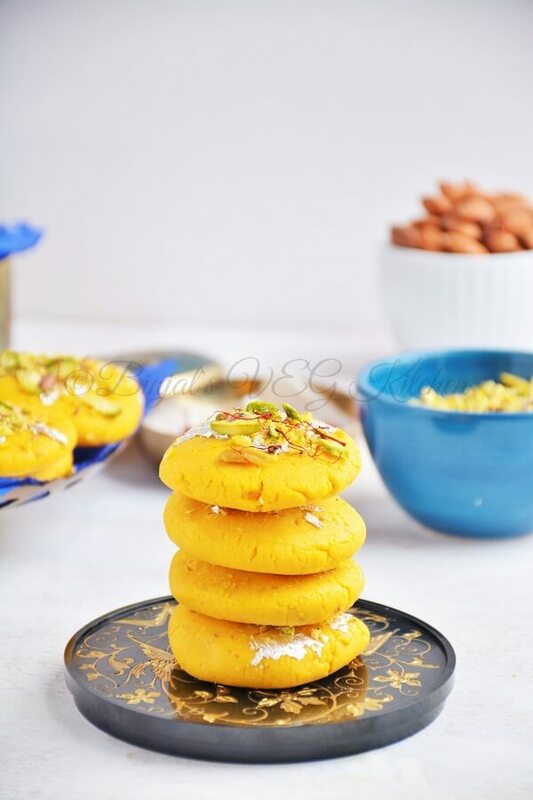 I have fallen in love with ur blog.. u have some amazing pix.. and this mango burfi is definitely a winner..
Can I use milk powder or any other substitute for mawa? yes you can sana!! 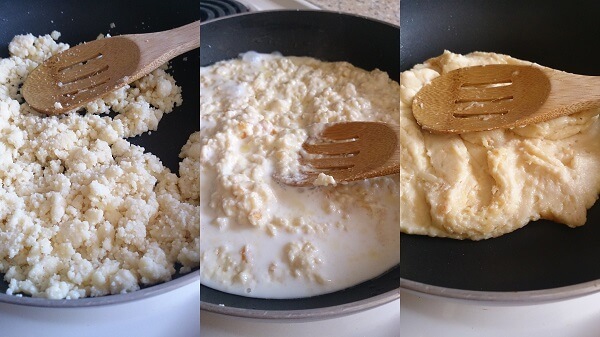 even you can use condensed milk or Evaporated milk, it will take little more time for thickening. I have a question. What is mawa? Can I get anything like that in Canada? Or should I make it? thanks Natalia!! Mawa is a milk solid, it is easily available in at any indian stores!! Thank u.mango is my fav fruit and so will try to make mango barfi.thanx 4 d recipe. Pedas look so enticing…absolutely halwai types…in love with that black thali too Binjal! wow that luks so yumm….luvly pics too…. I m using Nanak Khoya from Indian Grocery store! !